Do you feel like you get to be yourself, your true self at work? Or do you feel like you have to be a different version of yourself at work? 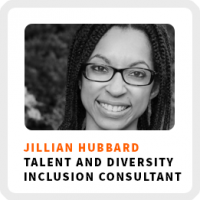 Jillian Hubbard wants to inspire you to be your authentic self at work, as well as inspiring employers to encourage more authenticity in the workplace. To accomplish this lofty goal, she’s building a talent and diversity inclusion consultancy. She helps companies achieve their goals by operating in a way that is more inclusive and embraces the diversity of its workforce. Why so many people don’t feel excited and comfortable at their place of work. How Jillian wants you to feel at the end of your workday. Approach conversations as part of a trust development cycle rather than a sales cycle. How she turned staying in touch with like-minded people in a system. Ways to make your business more inclusive, starting with yourself. Core work activities + habits: 1) Checking her calendar for to-do lists and appointments. 2) Taking time to step back from the day-to-day work and take an inventory of herself and the business. 3) Building relationships. Superpower: Building relationships and trust. Regains focus by: Embrace the loss of focus, take a break, then come back to it. 90-day goal: Business development and surviving grad school while scaling the business. 2) Even as an extrovert, she needs time to process interactions so she limits her days to no more than three big networking or relationship building meetings. Reach out to Jillian for a free intro coaching session! Email her at jhubbardconsulting@gmail.com and let her know you heard her here on the Life Skills That Matter podcast!